So why is there so much emphasis on "Mobile Friendly" lately when it comes to website design. Well until recently the majority of people viewing websites consisted mainly of those using desktop or laptop computers. However in the last few months that trend has changed. It's been coming for a long time and was almost inevitable, but as of this moment, there are now more people viewing websites on mobile devices, such as tablets and mobile phones, than on desktop or laptop computers. This is hardly surprising given the massive success of Apple's iPhone and iPad in starting a mini revolution in the way people browse the Internet. However this has caused many website designers problems; as websites primarily designed for viewing on desktop computers are not performing as they should as they are not optimised for viewing on the much smaller screens of mobile phones. And now with Google's recent update to search criteria, with emphasis being placed on mobile friendly sites, many none friendly sites are beginning to drop down the search rankings, or not appear at all when searching on a mobile device. So what is the solution? Well in a nut shell you need to get your website mobile friendly as soon as possible. That's not quite as simple as it seams; as many of these sites will have certain aspects of them that are not designed to work on mobile devices. In some cases it will be easy to fix those individual eliments, but in many cases the sites will need significant recoding. So how do you test if your website falls foul of the mobile friendly terms that Google now insist upon. Well thankfully Google have supplied a simple tool to test your website. Simply go to https://www.google.co.uk/webmasters/tools/mobile-friendly/ and enter you website address and it will analyse your website to see if it really is a mobile friendly design. That's right, we have finally got some time to do some work on our our website rather than everyone else's and launched the first incarnation of the Medical Media website. Over the coming weeks and months we will be updating various aspects of this site, including launching our proper Consultants Website Dirtectory. This will enable Consultants who want to gain further publicity and traffic for their websites to list them in our directory. All of our current clients will have the option to be listed in the Directory FREE of charge. We hope you like the site and find it easy to find what you are looking for. Unless you have had your head in the sand, you will have heard the term "Repsonsive Web Design" or RWD. Well, in a nutshell it is a type of website design that enables a website to respond to the type of device it is being viewed on and then display the site in a way best suited to the type and size of the screen. So whether you are looking at the site on a desktop PC, a tablet computer or a mobile phone, the site adapts and displays accordingly. This is often referred to as "Mobile Friendly". So why do you need a website that is responsive? There are two main reasons. Firstly having a website that is mobile friendly will enable a greater audiance to view your site. With the explosion of mobile browsing in the last few years, resulting in well over 50% of internet traffic coming from mobile devices, it pays to cater for people viewing your website from a mobile device. Secondly Search engines (particularly Google) are placing more importance on mobile friendly sites within their search results. So if your site is not mobile friendy, Google will give preference to another site that is. You can test if Google see's your website as mobile friendly by going to the Google Mobile Test page at https://www.google.co.uk/webmasters/tools/mobile-friendly/ and entering your website address. 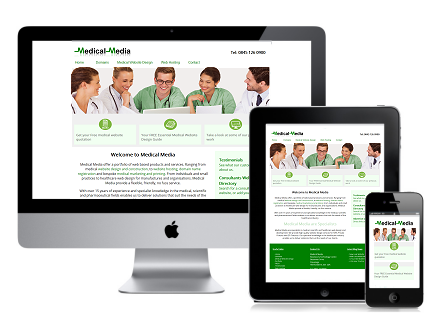 Thinking of Developing a Medical Website? If you are considering the creation of a Medical Website, make sure you read the Medical Media "Before You Start" guide. The "Before You Start" guide is a FREE invaluable document providing information on what you need to think about when deciding to engage a company to create a medical website for your practice. The "Before You Start " guide details various things to look out for and consider, as well as the pitfalls of website design, and could potentially save you a lot of money and time. Working within the medical profession, few would argue that lack of time is a major bugbear. And a large majority of that time is spent providing information to patients. If you could provide information to your existing patients or potential new patients, 24 hours a day, 365 days per year, would that not be a good thing? For so many consultants the idea of having a website is simply another drain on valuable resources and for this very reason it is usually last on the list of things to do. Time is money! Of that there is no doubt. With people working longer hours they don't often get time during normal working hours to find what they are looking for. It's at home in the evening after a days work that people sit down at their computer and search for what they need. Gone are the days of telephone directories, yellow pages and other such paper based directories. If someone is searching for a knee specialist, the internet is what they'll be using. And if you don't even have a website, then that potential patient will find their way to your competitors and be contacting them online to arrange an appointment, all while sitting in the comfort of their home. Having a website that provides all the information that a potential patient needs will encourage them to make contact in person. Information about common conditions, treatments, and where those treatments take place, as well as maps, directions of how to get there and a biography of the physician, all right there on the screen in front of them, give patients the confidence to make contact and build doctor patient trust. Having a website that is up to date and provides essential information on your practice is an essential tool in the private healthcare industry. Without it, you're only helping your competitors expand their practices.